10+ years ago I launched Army Wife 101. At the time it was a place for me to write my thoughts and share information about the daily challenges of military life. Over the years this community has grown, and part of that included being able to earn an income from this digital platform I own. Of course things have changed so much today. For one, 10 years ago there was no Pinterest, Snapchats or Instagrams, and the term “influencer” was not “a thing” like it is today. Today everyone whether they know it or not is an influencer of sorts. 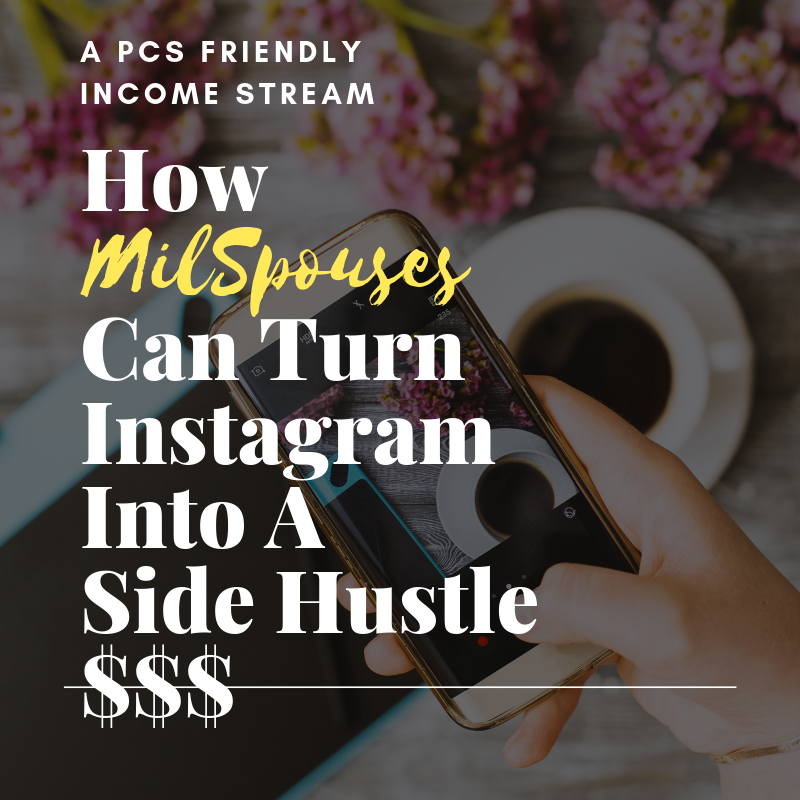 With employment being an issue for so many military spouses, we are turning to creating our own methods of income through side hustles and full fledged businesses. I am fascinated with making money online. However, I like to talk about it from a very practical standpoint. You will never see me selling instant 6 figure dreams. It’s amazing to me that most of the stuff we do online daily can generate us income or things to help in our household, and so many people don’t even know. 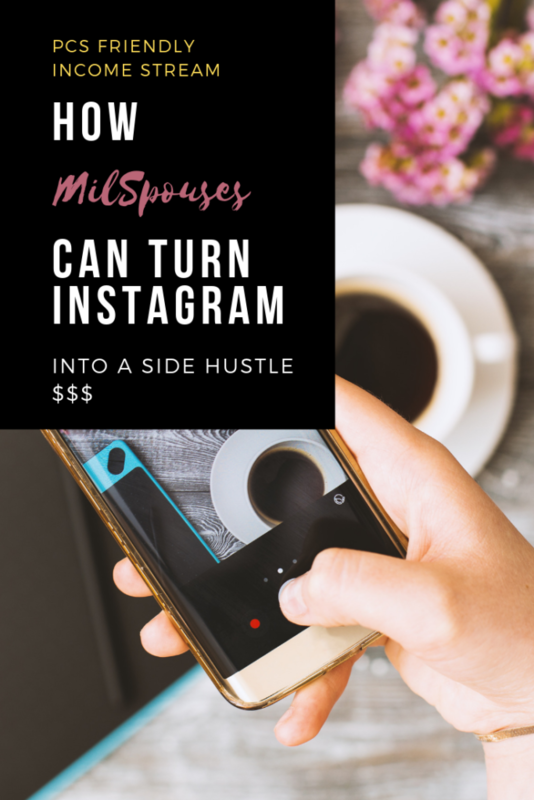 Which is why I am about to blow your mind if you’re a military spouse with an Instagram account. Get comfy with a cup of coffee and prepare to briefly learn how you may be able to monetize your Instagram account or use it to review products, travel, and services. Why Would Anyone Want To Pay Me Or Send Me Things For Instagram? Simply put the everyday person on Instagram in most cases is worth a lot then commercials these days or even a celeb. Think about it? When was the last time you watched a commercial in full? And, when it comes to celebrities we might follow them for fun and to get the scoop, but do we truly believe them when they try to promote every day things? You might be saying well I’m not like a Kardashian with a million followers. No, your not! However, while the Kardashians may have a great deal of reach, in most cases their engagement with their actual followers is not relatable. You, the every day person with 1,000 Instagram followers (aka a micro-influencer) has more of a loyal audience who actually believes you when you say you like something. Chances are your pictures and videos are things you’re actually doing which is why people will connect to them. Simply put—your audience is valuable to brands! 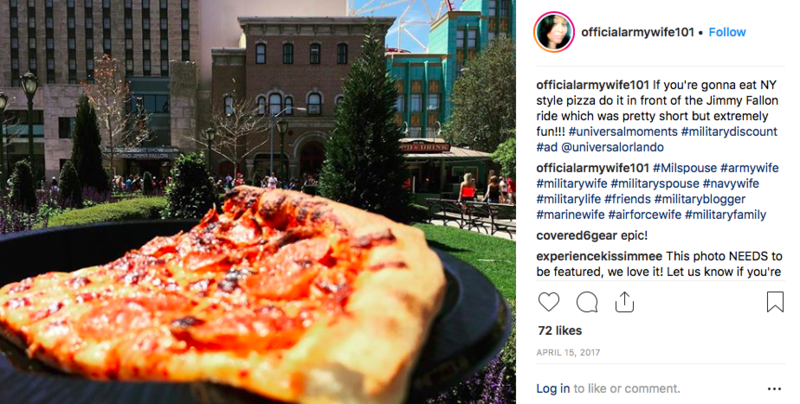 This is why they are willing to (at the bare minimum) send people like military spouses products to review or share on their Insta-Stories. As you can see I don’t have tons of followers on IG (4000+), but it doesn’t stop brands from reaching out or me from reaching out to them to work together, because my IG followers are people they want to reach. 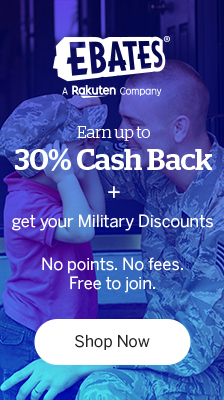 Why Would This This Be Good For Military Spouses? Military spouses despite tend to have one of the tightest knit online communities. We spend a great deal of time online, and we are a word of mouth community. We also need things that bring income that are portable and can be done anywhere we live. Being an Instagram micro-influencer only requires your phone. Where you’re stationed and where you travel can be your canvas. Also, it’s no secret that you probably know a ton of military spouse photographers. This is a great chance to flex your camera muscle and photography knowledge. Which Military Spouses Can Do This? Have at least 1,000 real followers- Do not EVER buy followers. We can tell when their fake! If you aren’t there yet interact with other friends accounts and post authentic comments on their photos. This is one of the very simple ways to grow your following. Take really good pictures- This means don’t put dark grainy pictures up. Nice natural day light is your best friend and if you don’t get good light in your home the Colorstory app is your best friend. You don’t need a fancy camera. Your smartphone will do. If you really want to get fancy you can buy a cheap ring light. 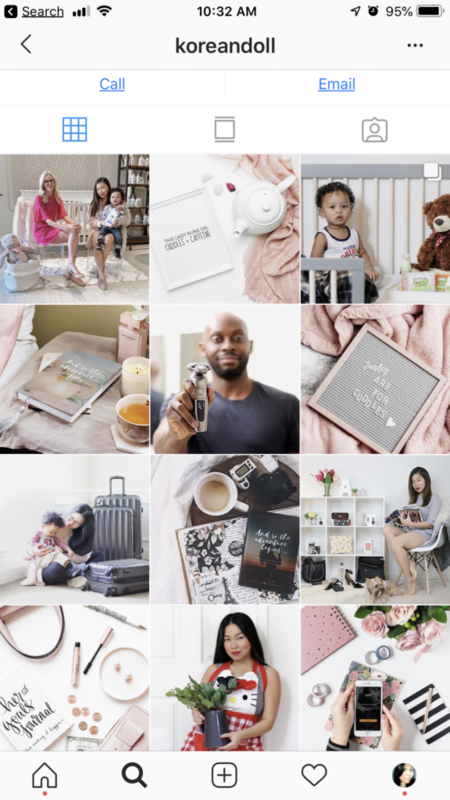 Have some sort of theme to your Instagram- I’ve come across so many military spouses who aren’t bloggers or Instagrammers who have amazingly beautiful IG feeds that focus on one thing. So think about if there’s a reoccurring theme to your feed. Do you tend to show a lot of coffee cup photos, family photos, food pictures, or images of recipes you tried? Do you love fashion and love to show off your outfit photos? If so chances are you can work with a brand. 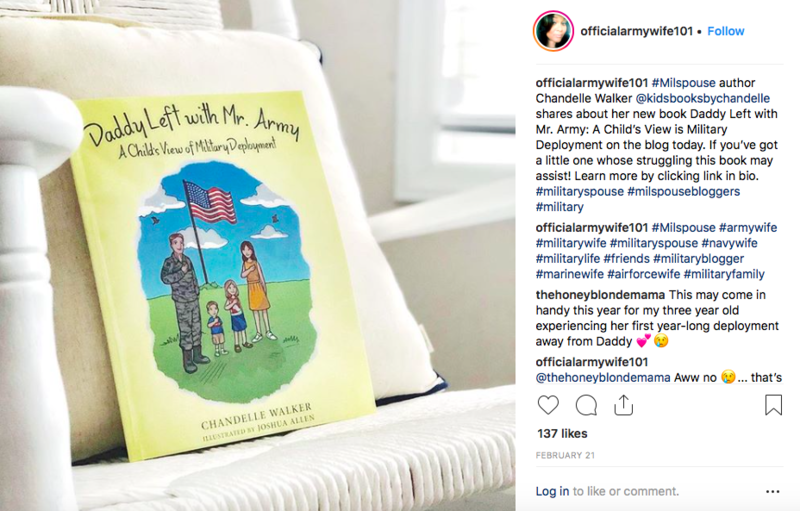 Here is one of my favorite Instagram Influencers who is a military wife. Her IG feed is so pretty! now granted she is a blogger and influencer, but as you can see there is a color scheme and theme throughout her feed. Do your followers engage-Are you getting lots of likes on your photos? This doesn’t mean hundreds or thousands, but do the people who follow you respond to you when you post images? Are you paying attention to what types of images they like the most? These are things to look at if your interested in doing this. Consistency- If your last post was two months ago then trying to partner with brands is not the best option for you at the moment. If a company is going to send you something at no cost, they need to know that you are getting daily engagement and are still active. Treat This As A Business- The moment you start accepting products or cash from anyone or a company you are now a business, even if you consider this a side hustle. You will need to fulfill your commitments, or risk being blacklisted and not worked with. Private IG– If you are going to do this then you CANNOT have your IG as private. There’s several ways to use your Instagram to earn money or products. Fashion- You can reach out to new clothing boutiques on IG that you like and propose they send you an outfit in exchange for modeling and featuring on your feed. In most cases these companies will also offer a promo code to give to your followers. RewardsStyle- Every had someone say where did you get blouse or shirt? This program allows you to link to anything you buy and when your followers purchase it you earn a commission. You’ll definitely need to study it but overall it’s a great option. Reach Out To New Places In Your Area- New restaurant opening in your town? New kids attraction? Reach out and ask can you introduce them to your local followers. Use your IG to be what is known as a “hyperlocal” influencer. This is someone who writes about (and sometimes attends) local happenings. 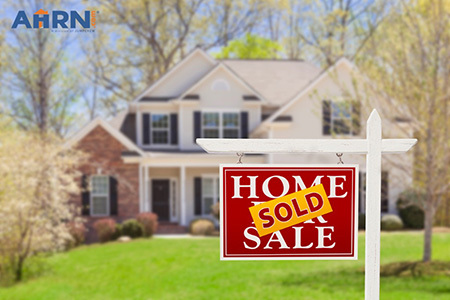 Advertise- You probably know a ton of people who have businesses and maybe they’ve come to you asking you to promote it. Charge a small fee and offer them a insta-story where you tag them and share an image they send or charge a bit more and create an insta-story for them. Make sure it’s something of interest to your friends though. Kids– Do people love when you post your little ones doing all the things kids do? How about product placement with a new toy they’ve been wanting? Like a certain kids clothing brand? Being a family IG influencer is a great way to get these free products from companies in exchange for promoting it. Once you become really good at it, you can start to charge if you notice that traffic increases and that people are responding well. How Do I Reach Out To Brands And What Do I Say—Ready To Do This? If you’re ready to get your digital hustle on I have got you covered. Over the next weeks we are rolling an entire section dedicated to working from home and this is part one of how I am teaching you to use your digital platforms.